Are you still on the fence about letting your child use an iPad or other mobile technologies? The latest survey by Common Sense Media shows that even since their last survey two years ago, media habits of children have changed significantly. One large difference includes the average daily use of mobile devices. Time spent on a mobile device has tripled from 5 minutes to 15 minutes in the past two years. Despite your stance on to tech or not to tech, all parents are looking for ideas on how to engage their children without the use of a screen. 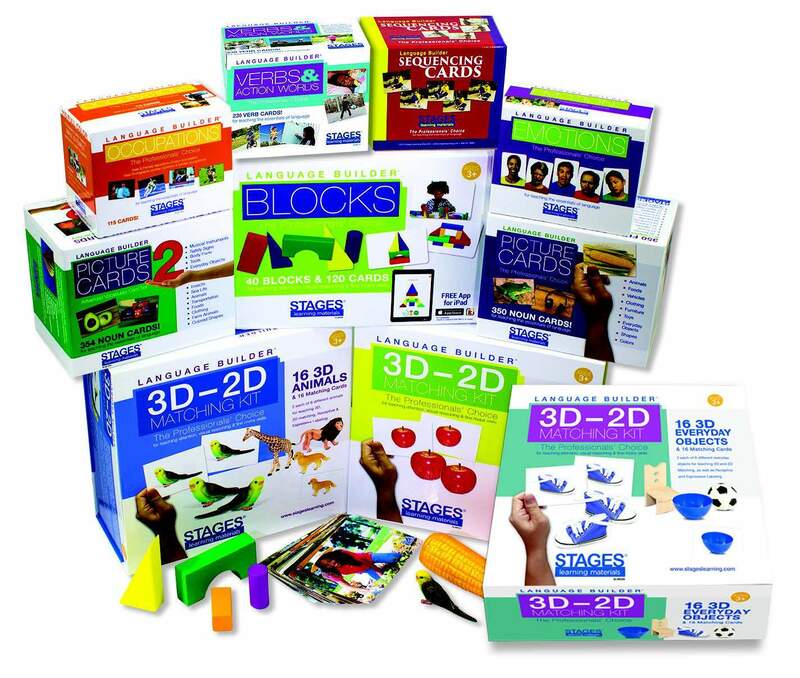 This week we will focus on an app that blends digital and hands-on learning, in a different way, and provides parents access to information and learning activities without exposing children to added screen time. Sesame Street has recently launched an app called Sesame Street Family Play ($0.99 with in app purchases). This app requires no screen time for the child. 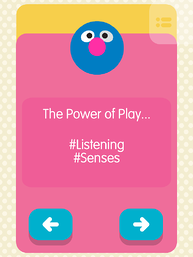 The app provides games and activities that turn transition time into playtime. As the title suggest, the app encourages all family member to play along. 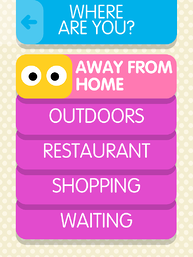 Immediately upon turning on the app, you are prompted to tell where you are (at home, away from home, or traveling). The app then generates activity suggestion based on your location and the number of people available. As all Sesame Street products, activity ideas help to build various school readiness skills such as counting, literacy, and gross and fine motor skills. 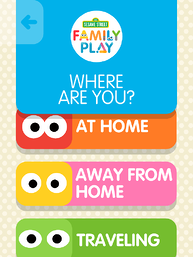 The app is simple and designed for a preschooler to pick up and use. Grownups can use the app with their child, but the real learning happens off screen. The interaction with the screen provides an opportunity to practice using a mobile device without being passively engrossed. An example of an activity suggested for restaurant use with two kids playing is called “Speak Up.” Kids have to pick a silly word like “watermelon” or “kindergarten” and say it once as quietly as they can. They keep repeating it, each time a bit louder than before. The other players have to guess the word. The person who gets it leads the next round. The app even suggests ways to differentiate and make the game harder. 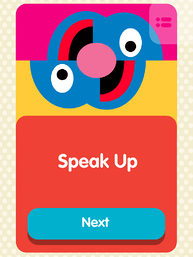 For instance, to make “Speak Up” a bit trickier, the guessers have to close their eyes so they can’t read lips. 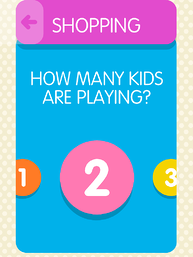 The app explains what skills kids build through the activity. 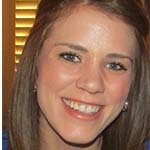 In “Speak Up” kids build their listening and senses skills. Along with apps that encourage activity away from the screen, there are apps that limit your child’s amount of screen time. The app Parental Time Lock ($1.99) allows you to set the timer and when the time is up, the device is locked and can only be opened by a passcode that you set up. 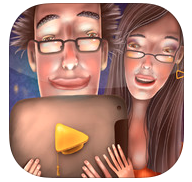 ScreenTime app ($1.99) allows grownups to allocate screen time minute allowance to the child. The minutes can be set to repeat each day or you can set different daily minute allowances. Kids can build minutes by completing chores or daily other tasks. Whatever your choice regarding your child’s use of technology, there are options. We would love to hear about what works in your household. Please share by commenting below or on our Facebook page. "Zero to Eight: Children's Media Use in Amerca 2013." Children's Media Use in American 2013 Inforgraphic from Common Sense Media. 4 Nov. 2013.